It’s the end of January and we’re roughly at the mid-point of the ski season. Since there’s an ugly (but blessedly brief) thaw underway I won’t be skiing at West Mountain tonight (missed last week too – bad string of luck lately). Here’s another By the Numbers installment instead. The "% Currently Open" statistic in the table below is an interesting one. The fact that no one’s at 100% reflects a low-snow January, the multi-day thaw we suffered through earlier in the month, and some mid-week terrain closures (particularly Gore). But the % open statistic is also just a snapshot – most skiers, myself included, are of the opinion that the 2012-13 ski season has so far been much better than last year. After skiing at Whiteface last weekend, it felt good to be back at Gore again today. The stretch of cold weather we've been enjoying has allowed the snowmaking crews to resurface apparently every trail - or at least all the ones we skied - with chalky and very consistent packed powder. Our warm-up and end-of day runs on the lower mountain were fun, but the place to be was at the summit, where every trail was in nice shape with edgeable snow, fun bumps and a bright blue sky. With summit temperatures hovering around zero you didn't want to sit still for long, but there's nothing wrong with that! You can always count on Whiteface to deliver a bit of adventure for your ski day, and we got a good dose on Sunday and Monday in the form of wind (Sunday) and cold (Monday). Luckily, the adventure included plenty of great skiing too. A little snow can make a big difference. That was the case at West Mountain last night, where 2 – 3 inches of new snow that fell on Wednesday softened the slopes, or at least lessened some of the scratchiness. Trails leading back to the triple chair, Mach and Bannister, had the nicest snow – no surprise since those trails get quite a bit less traffic than the trails that lead back to the double chair and lodge. 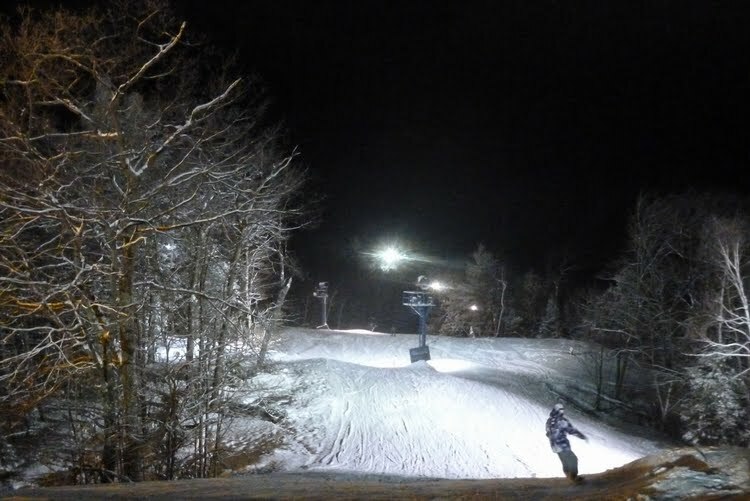 Last night’s conditions were a big improvement over the previous Wednesday night, which featured hardpack and frozen granular. The January thaw brought a taste of spring skiing to Gore Mountain on Saturday. Fog and clouds on the lower mountain hid all signs of the great conditions above, until breaking into sunshine and blue sky on at top of the gondola. With temperatures in the 40s, surfaces softened into hero snow top to bottom. A guy could get used to conditions like these. The snow that has fallen at Gore since Christmas, combined with seasonably cold temperatures, has put the mountain in prime mid-winter shape with every trail open and every lift spinning. 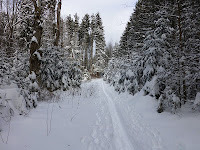 Oddly, or maybe not so oddly, I’ve spent very little time this season on trails that I count among my go-to favorites. I haven’t even been on Hawkeye or Chatiemac this season, though I’m sure they’re in nice condition. Instead, we’ve focused our skiing attention on Gore’s glades. 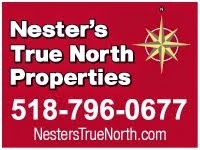 Skiing has a long history in North Creek, with roots in the early 1930s. Early “Ride Up, Slide Down” skiers arrived by train and then rode in flatbed trucks to the Barton Mines property on Gore Mountain where a network of ski trails led back to North Creek. 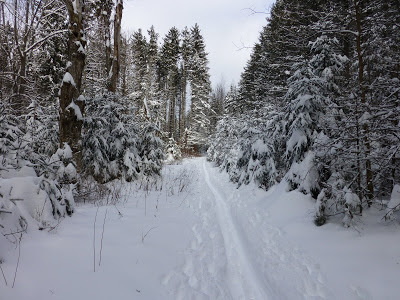 The trails were immensely popular, with hundreds of skiers arriving in North Creek on weekends with good snow conditions to ski trails like Halfway Brook, Raymond Brook, Pete Gay and Rabbit Pond. Those early trails even gave rise to the first Ski Patrol, experienced skiers who assisted injured skiers with first aid kits and toboggans and swept the trails at the end of the day. Eventually World War II intervened, interest shifted to development at the North Creek Ski Bowl, and the old Ride Up, Slide Down trails fell into disuse. Until Steve Ovitt came on the scene. You couldn't have asked for a more beautiful day to start 2013: cold, crisp, clear and plenty of snow on the mountain. We took the last two days off from skiing in order to visit family, and when we returned today the mountain had a much different feel. All the crowds from the holiday weekend were gone, and we felt like we had the mountain to ourselves. Today the mountain skied like a mid-week day. The only difference was that the mountain was 100% open with every lift spinning.